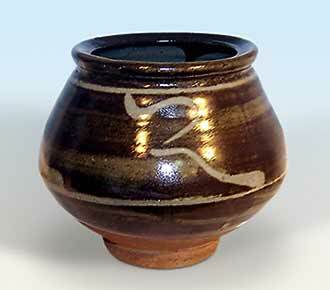 Hamada footed bowl - 9" (228 mm) high. Shoji Hamada was born in Tokyo in 1894. At the age of nineteen he started to study ceramics at Tokyo Technical College, and two years later spent some time touring Japan's traditional pottery sites. In 1918 he met Bernard Leach, and within a year the two men were working together at Abiko. In 1920 they both came to England and Hamada helped Leach build the climbing kiln for the St Ives Pottery. He gave two exhibitions at Paterson's Gallery in London in 1923, and then toured Europe and returned to Japan. He exhibited again at Paterson's in 1929 and 1931, and in 1932 went to the United States with Leach. During the next three decades he made many more trips to the USA. He is regarded as one of the most influential masters of studio pottery, and has probably inspired more potters than any other figure. The simplicity of his designs gives them urgency and power. This man, who was once declared a 'national living treasure', is certainly the jewel in studio pottery's crown. He died in 1978.